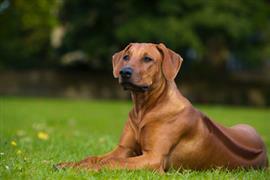 The Rhodesian Ridgeback is a large breed originating in South Africa. Also referred to as the African Lion Hound, these dogs were often used to hunt lions and other large game. Names related to lions both real and fictional are highly popular among the breed. A couple of lion themed name options include Simba (meaning lion in Swahili) and Tau (meaning lion in Tswana). Other options, like Decoy, can be taken from their role in distracting the lion while the hunter went in for the kill. Likewise, typical hunting related names like Hunter, Bullet, and Recoil provide a slew of other choices. True to the breed’s roots, many owners choose names like Hondo and Obi that are of African origin. Some of our pages will contain a subcategory. A subcategory is a slightly more specific grouping than the main topic of the page. For a subcategory, we will include a separated table of names and corresponding descriptions. An example of a subcategory of Red Dog Names would be 'Dog Names Inspired by Red Wines'. If you have any subcategory ideas for the Rhodesian Ridgeback Names page, we would love to hear them. Use the form below to submit your ideas.